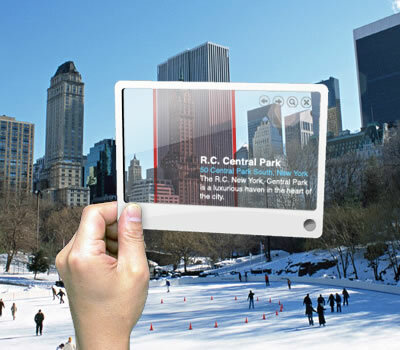 The Looking Glass is a design concept by Tokyo resident Mac Funamizu that would provide for transparent mobile internet search. Really transparent mobile search. The basic idea is both simple and usable. The user of the device essentially "frames" his question by using the device to frame a picture. In the illustration above, the user frames a building. The device takes a picture of what the user sees through the glass, analyzes the image, and then outlines key parts of the image, adding information from internet sites. Another potential use would be to lay the device on a book page. The device could look up references and, with a touch screen display, could look up individual words. 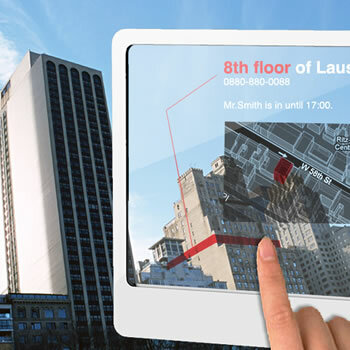 Providing a good informational overlay is a great use of the augmented reality concept. Science fiction fans got to have some great examples of how this future technology will be overlayed on their lives in the recent novel Halting State, by Charles Stross. Consider the overlay specs, which are very helpful when playing SPOOKS. The idea for a science-fictional see-through display has been around for a while. H.G. 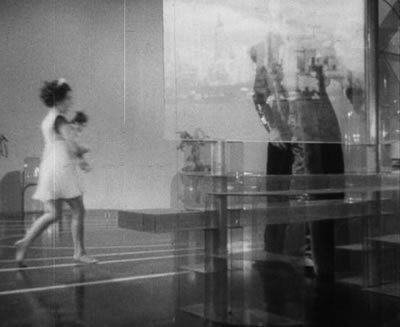 Wells played with the idea in his futuristic 1936 film Things to Come, with a transparent wide-screen flat panel display (click link for more views). From Future of Internet Search: Mobile Version via Yanko Design; thanks to Moira for the tip.